Furukawa, worldwide manufacturer of optical fiber, cables and network, and telecommunication network infrastructure and IT, joins GeeksHive International. With an initial investment of more than U$D 3 million, the Japanese company has recently opened a plant in Berazategui, province of Buenos Aires, to supply the internal and regional market. This plant is located in Berazategui´s industrial center and it manufactures 200 thousand kilometers of optical fiber a year to supply telecommunication companies of the country and the region. Structured cabling of high performance solution. FTTx Solutions- Fiber To The Home, Apartment and/or Building. GigaLan Augmented Solution, Copper Systems to 10 Gbps. TeraLan Solution- Optical systems of High performance. 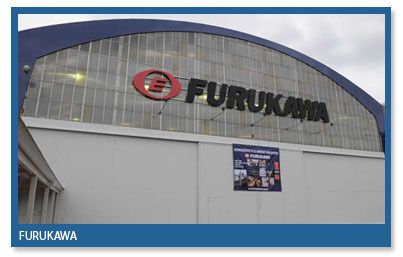 Furukawa, leader in the South American market of structured wiring, is constantly updated with the applicable standards for its products and systems. Furukawa is, at present time, the only company in Latin America member of TIA, Telecommunication Industries Association, participating actively in the creation of the ANSI/EIA/TIA standards in the structured wiring area. It is acting in a pioneer way in the development of solutions for high performance transmission networks architectures based on optical technology. Nowadays it is the only trademark with a specific test lab for FTTH in the Brazilian market with applications of the technologies in several environments, providing for the infrastructure requests for construction of new optical mesh in the entire Latin American region. Furukawa’s technologies for optical networks are present in different areas: telecommunication operators, civil construction and ISP (Internet Service Provider). For the telecommunication sector, Furukawa offers components that integrate its own infrastructure projects. For the civil construction sector and for Internet providers, the company offers a complete solution, with components, accessories and equipments. Furukawa announces that it has created a free 0- 800 phone line for its partners, where they will be able to obtain technical support. By means of this launch, Furukawa looks for the generation of a direct contact with its business partners, putting at their disposal the possibility of asking for advice related to their telecommunication products. The creation of this new way of communication will allow us to learn more about their suggestions and particular needs. Furukawa en el 2009, estará más cerca de sus clientes y usuarios. A partir de este mes, ya cuenta con su propia línea telefónica gratuita. Aquellos interesados en utilizarla, pueden hacerlo llamando al 0800-800-9701. Furukawa in 2009, will be closer to its clients and users. From this month on, it already counts with its own free phone line. Those interested in using it, can call to 0800-800-9701.